The NAT-MCH-PHYS addresses the requirements for management and high bandwidth switching to both AMCs and the rear transition slot of the MCH in PCIe based MTCA.4 systems, targeting large control and data acquisition applications. The NAT-MCH-PHYS is based on the NAT-MCH-M4, our double-width MCH base board for MicroTCA.4 systems, combined with the NAT-MCH-CLK-PHYS, our special low latency and low jitter clock module, to create a PCIe Gen3 hub module that is a management and switching solution for MicroTCA.4 systems. The clock module NAT-MCH-CLK-PHYS has been specially designed for physics and scientific research applications, providing a very low jitter and low latency clock at CLK1 and CLK2 and a fixed mean 100MHZ PCIe clock. The NAT-MCH-PHYS is capable of sourcing an external clock from, or delivering an internal clock to, two SMA inputs or outputs on the front panel. This allows installations of many MTCA systems to be synchronized to a central clock source in a very elegant and easy to use way. The PCIe hub module provides a 48-port PCIe Gen3 switch that allows each of the 12 Advanced Mezzanine Cards (AdvancedMCs or AMCs) in a MicroTCA.4 system. The PCIe switch also provides the ability to establish up to six virtual PCIe clusters and assign the AMC slots to these. 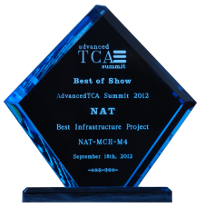 The NAT-MCH-PHYS fully supports redundant management and power environments. Frequent exchange of the internal databases with the secondary MCH and a heart beat mechanism ensure an immediate switch-over from the primary to the secondary MCH whenever it becomes necessary (PCIe fat pipe switch over may require additional precautions). The NAT-MCH-PHYS can handle up to four power modules, such as the NAT-PM-DC840 or NAT-PM-AC600, for N+1 configurations. Apart from the Java GUI NATview the NAT-MCH-PHYS also supports external management solutions which are based on the Remote Management Control Protocol (RMCP), such as the open-source tool ipmitool. Furthermore, using the NAT-MIB the NAT-MCH-PHYS can also be integrated into environments based on the Simple Network Management Protocol (SNMP). The NAT-MCH-PHYS can be configured using either uploadable text based script files or via the integrated web interfaces using a standard web browser. Finally, the integrated debug and configuration facilities can be accessed via a serial console or using Telnet or SSH. Customers registering for the firmware update service are automatically notified by e-mail when a new firmware version becomes available. For customers who need a rear transition module for their application, N.A.T. offers the NAT-MCH-PHYS80 variant, which supports our NAT-MCH-RTM. This RTM can accomodate a user-accessible Intel® quad-core Core™ Xeon E3 ComExpress module, turning this combination of MCH and host processor into a true single-slot solution providing the root complex in any MTCA.4 system. The NAT-MCH-PHYS is a powerful management and data switching module for all MicroTCA.4 systems targeted at PCIe- based applications with a need for high-bandwidth.